West Baltimore asks: Will Liquor Board spare them from more booze joints? 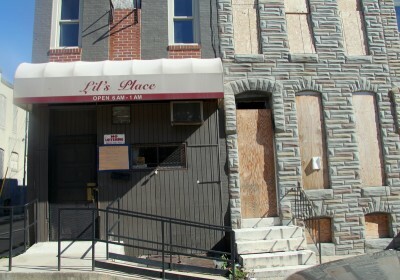 Above: Lil’s Place, in West Baltimore, as it looked in 2014. Once again, leaders representing struggling West Baltimore neighborhoods were in City Hall to speak out against a liquor establishment they said was would hinder efforts to lift their community up. But this time Marvin L. “Doc” Cheatham didn’t have to bring the big map on a poster board showing the high concentration of liquor stores and taverns in the area he represents as president of the Matthew A. Henson Community Association. Cheatham had come to Thursday’s Liquor Board meeting to support Lafayette Square Association President Arlene Fisher, who had something even more persuasive in her purse – articles showing that the license being transferred to her community for a “jazz lounge” was, technically, dead. Perhaps Fisher and Cheatham didn’t have to make the saturation argument, they could just hope the board would enforce the law specifying that licenses unused for 180 days no longer exist. There were withering quotes in the articles from the Community Law Center pronouncing this license (from the old Martick’s restaurant, closed since 2008) extremely dead, but they also detailed how the previous board had repeatedly given the license new life. Under new chairman Thomas Ward, would the board reanimate this “zombie license” yet again? The panel’s unanimous vote was gratifying for Fisher, especially considering the outcome a year ago when the previous board had voted unanimously in the opposite direction. Then the panel granted Anthony Ogbuokiri’s request to transfer the old Martick’s license to the Harlem Park address (1213 Edmondson Avenue) despite the fact that all 17 members present at a meeting of of the Harlem Park Community Council had voted against the transfer. Prior chairman Stephan W. Fogleman, before announcing the board’s decision, noted that no member of the community was present and dismissed their letter of opposition, saying it was anti-alcohol and not very specific. “Generally vacants cause more trouble than a nightclub does,” Fogleman said. But the “old board” is not alone in prolonging the life of zombies, something West Baltimore has seen as well. Consider what happened with Lil’s Place, 1909 N. Pulaski Street, at an August hearing conducted by the “new” board consisting of Ward, Commissioner Dana Petersen Moore (appointed with Ward in June), and incumbent Harvey E. Jones. Cheatham, who happened to be in the room that day on another matter, spoke against licensee Lillie Driver’s request for a hardship extension. Firefighters putting out a March 8 fire next door, Driver told the panel, had damaged her business and she was having trouble getting it going again. “We would prefer to see all of our liquor stores closed,” he said, noting that his neighborhood has 18 liquor licenses. The only local community with more than 18 is Greater Greenmount, he said. Cheatham shouldn’t even have had to make his arguments. 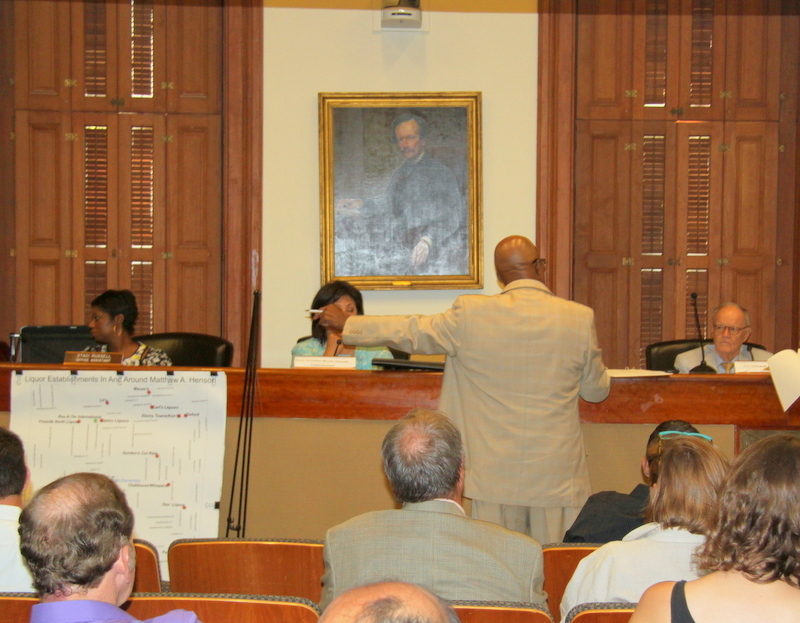 But at the August hearing, the commissioners never raised the expired license issue. Questioning Driver sharply, Ward concluded that she had ” given us no hope that this will be anything other than an empty building.” But Jones seemed to take pity on her (“this is her livelihood”), as did Commissioners Moore. They voted 2-1 to grant the extension. Driver was given six months from the time of her April 15 hardship extension request to reopen. The business appears to still be closed and a transfer request is on the schedule for this Thursday. “That license is so dead,” said Rebecca Lundberg Witt, the Community Law Center attorney who writes the Booze News blog, in an email to The Brew about the case. With the board granting hardship extensions and transfers to some dead licenses like Lil’s Place, and extinguishing others, such as the Martick’s license – licensees and communities are still trying to figure out the new board’s direction. Following last month’s high-profile killing of the Crossbar license in upscale Federal Hill, the commissioners are under scrutiny. The decision against applicant Ogbuokiri was an easy one for the board in enforcing the 180-day rule, Witt said, because he had made no progress on his project and didn’t even show up for Thursday’s hearing. “What will be interesting is whether the board has the consistency to enforce the law when a popular, expensive project has violated the 180-day rule,” Witt said. In West Baltimore, meanwhile, community leaders simply want tougher regulation of establishments they see as a nuisance. What they say they will be watching is how the new board will balance their interests against those of business-owners. “I am going to be spending a lot of time down here for these [Liquor Board] hearings,” Cheatham, the former head of the Baltimore branch of the NAACP, said. Ward signaled some skepticism in September when Cheatham objected on behalf of his community to a requested ownership transfer for Doc’s Liquors, at 1401 Fulton Avenue, saying the neighborhood was “inundated” with liquor licenses. 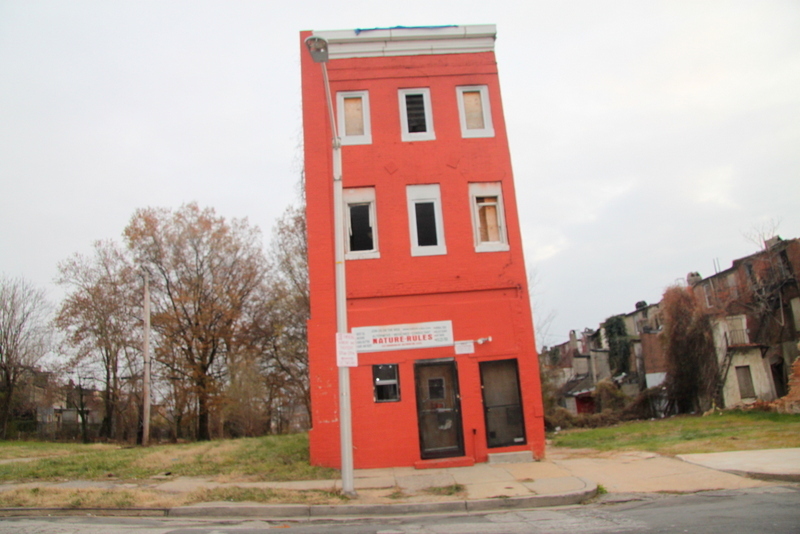 In another case, 40 Liquors, at 2822 Edmondson Avenue, community leaders offered vivid testimony about the negative impact they thought a bar would have located less than two blocks from Alexander Hamilton Elementary School. Existing bars and bottle shops are a blight, said Dewey Barksdale, president of the Franklintown Road Neighborhood Association. “You can drive up there any time of day and see bags flowing and liquor bottles laying everywhere on the street,” Barksdale said. 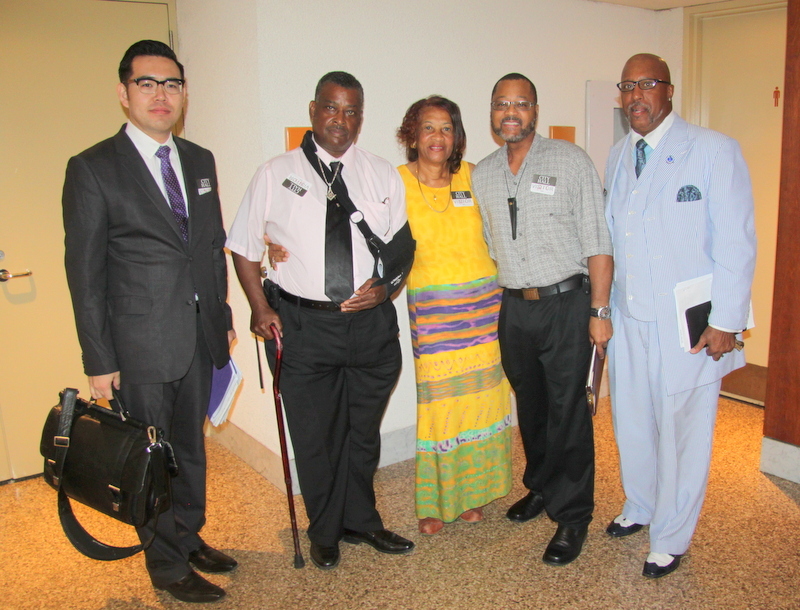 Robert Hunt testified in opposition to the transfer on behalf of Alliance of Rosement Community Organizations, noting there are churches and a senior citizen residential building in the area. There are already four liquor stores in the 2800 block of Edmondson Avenue, Hunt said, telling the commissioners they generate crime and other problems. Ward seemed to agree, saying “This is a high crime area. It makes the paper frequently.” He also seemed irritated when the licensee’s attorney Melvin J. Kodenski, asked for a postponement, explaining that 9th District Councilman William “Pete” Welch had the parties meet in his office and was trying to get involved. “Councilman Welch doesn’t make decision, the board makes decision,” Ward said, denying the postponement request. The transfer request was denied. Score one, that day, for the community.